I highly recommend "Saddam Tapes: The Inner Workings of a Tyrant's Regime, 1978-2001" edited by Kevin M. Woods, David D. Palkki, and Mark E. Stout, which was recently published by Cambridge University Press (also at Amazon, Worldcat and preview at Google Books). The Saddam Tapes consists of edited transcripts of audio tapes of Saddam Hussein and senior Iraqi officials. The transcripts are extensively annotated with footnotes and text to put them in context. I am still making my way through the transcripts, which are fascinating and at times harrowing. The book's introduction briefly discusses the history, benefits, and challenges of using captured documents for research. From the publisher: During the 2003 war that ended Saddam Hussein's regime, coalition forces captured thousands of hours of secret recordings of meetings, phone calls, and conferences. Originally prepared by the Institute for Defense Analyses for the Office of the Undersecretary of Defense for Policy, this study presents annotated transcripts of Iraqi audio recordings of meetings between Saddam Hussein and his inner circle. 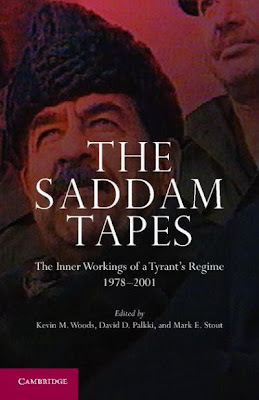 The Saddam Tapes, along with the much larger digital collection of captured records at the National Defense University's Conflict Records Research Center, will provide researchers with important insights into the inner workings of the regime and, it is hoped, the nature of authoritarian regimes more generally. The collection has implications for a range of historical questions. How did Saddam react to the pressures of his wars? How did he manage the Machiavellian world he created? How did he react to the signals and actions of the international community on matters of war and peace? Was there a difference between the public and the private Saddam on critical matters of state? A close examination of this material in the context of events and other available evidence will address these and other questions.